The first book I made is a screen-printed story titled “Pink Lemonade” from 2007. It was a follow-up story to a lemon and lime head illustration I made, and it introduces the lemon head world. 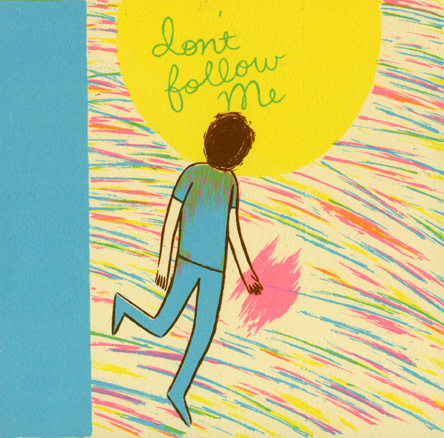 The most recent book I made is a 12 page screen-printed mini comic titled “Don’t Follow Me” which is the fourth installment of my silk screened comics series involving the lemon world. It’s about a boy who chases a ghost. 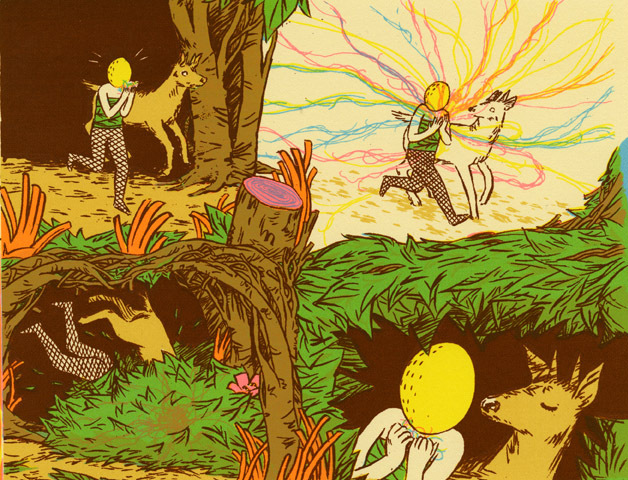 I’m planning on making a new book to debut at LA Zine Fest, it may or may not involve more lemon heads. I’m pretty happy about all the screen-printed books I’ve made. So much work/labor has gone into them, it’s hard to pick a stand-out. I get inspiration from all different outlets, ranging from personal stories/experience, music, and other artists. I cook all the time. I keep a photo diary tumblr that’s been mostly pictures of food, places, and some art. < Sunday, Sunday, SUNDAY: L.A. Zine Week begins 2/5/12!